Fornite is a hugely successful battle royale game that is free-to-play on all platforms – mobile and consoles. Despite it being a free-to-play game, Fortnite sealed copies for the PlayStation 4 and Xbox One are fetching hundreds of dollars online. 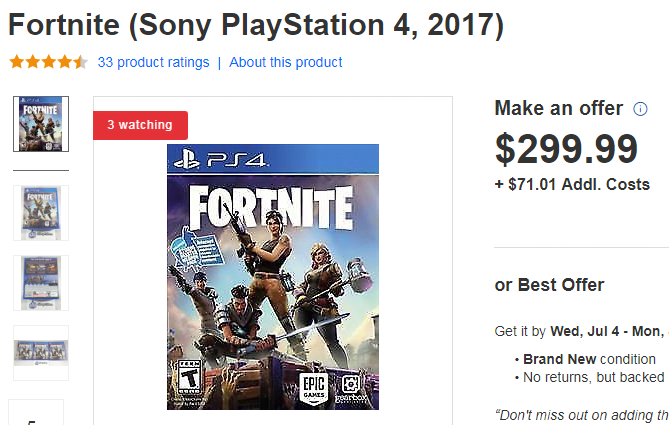 As noted by GameSpot, Fortnite sealed copies are selling for as much as $500 on eBay. Most of the sealed copies are selling between $200 to $400, but some are fetching higher. According to GamesRadar, certain copies on Amazon are selling between £150 to £1000. And, people are actually buying the physical copies at those prices as there are several old listings that show the copies were purchased. This is crazy considering the game is free to download on both these consoles. So, in reality, people paying a premium for the Fortnite sealed copies are just paying for the box, disc, and access to the Fortnite’s Save the World PvE portion. Even Save the World is expected to come as a free-to-play product later in the year. A question that naturally arises is why people are paying so much for the game that is available for free. The first reason is the massive popularity of the game, and second, more important reason is that Epic Games, the company behind Fortnite, is no longer selling the physical copies of the games for the PS4 or Xbox, but instead, is encouraging free digital downloads. So, if you are a collector or a big fan of the game, you need to pay crazy resale prices to get your hands on Fortnite sealed copies. Selling sealed copies of the game is not the only way the gamers are using to make money from Fortnite. The battle royale-style game is reporting record revenue every month, for instance, in April, the game made $300 million, according to gaming research firm SuperData. In the game, players buy in-game currency called v-bucks with real money. Gamers use the v-bucks to acquire new skins, accessories and emotes for their character. Epic Games is also leaving no stone unturned to make as much money as possible by releasing different character skins almost every day. To leverage the growing popularity of the game, some are selling Fortnite accounts and services on unofficial marketplaces like eBay. What is even more surprising is that people are actually buying these services and accounts. Sellers use these online marketplaces to auction their account, which is fully loaded with skins, emotes and accessories. After the deal is reached, the seller sends the buyer the needed details to access the advertised account, notes a report from CNBC. On one hand, where players are spending hundreds of dollars on cosmetic purchases, others are paying to hone their skills and up their stats. On the online marketplaces, players can also find coaching sessions for about $20 an hour. Also, many are even offering services under which they log into the buyer’s account to improve their stats. Apart from these services, online marketplaces are also being used for bad transactions. For instance, a few months back, hackers were selling deeply discounted access codes for Fortnite. Many players complained of fraudulent charges on their accounts claiming that their account was hacked. Following such incidents, Epic Games increased the security, and is making efforts to warn and protect players from the hackers. Epic Games is expected to soon come with the much-awaited Playground LTM. For a long time, there have been rumors of a new limited-time mode hitting Fortnite, but the mode has only recently been confirmed by an in-game message. “Let your creativity run wild on your own private island,” the message read. Further, the message says that Playground “will load you into the Battle Royale Map with some adjusted settings…. Battle and build to your heart’s content with an extended period of time to roam around the map as well as increased resource generation.” From the description, it appears that the new mode will serve as a private server for the player and their squad, where they can practice new skills without fearing an enemy attack. Meanwhile, Fornite recently landed on one more platform – Nintendo Switch. Though there have long been rumors of the game coming to Switch, no one expected its launch on Switch so early. The Switch version of the game has grown quite popular as it comes with support for cross-play with Xbox One, PC, and iOS. Also, only the digital version of the game is available for download.